Hmmm ... dunno, i've never seen Gulf darter. I'd better leave these ID's to folks with more experience than me in GA. However, I dont think that last sucker is a hogsucker; i'd guess jumprock or redhorse. I'll go with Michael's expertise. Didn't realize AL hogsuckers were so stripey-looking. Michael, what is you opinion on the Bass? Also #1 and 2, which I think is a Striped Jumprock. I am pretty sure #10 and #11 are Gulf Darters but still not 100%. Thanks. i'm no good with gamefish, but I would guess redeye. Sounds good, thanks for the id's fellas, had a fun trip. I agree with most of the IDs. And yes, your last sucker is an Alabama hogsucker and the bass is most definitely a redeye. Questionable about the Etheostoma darter though... Sawcheek should be farther east, and Gulf just doesn't quite look right. At first glance I thought goldstripe darter, but you are just wee bit too far north, BUT it is a possibility. Anything wrong with the subject fish being a swamp darter? 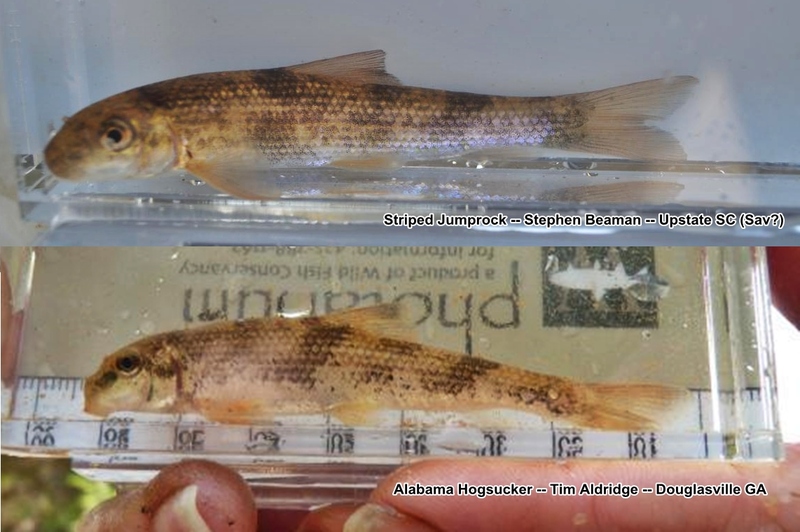 Gulf darter is more related to the rainbow/orangethroat lineage, whereas your fish look more like the swamp/sawcheek clan (subgenus Hololepis). Swamp darter sounds like a good possibility, since Fayetteville is out of known range for sawcheek (UGA Fishes of GA website). You don't have a better head shot of them, do you? I think the darter is likely a funky swamp. Goldstripe is further west like Will said and has a more obvious lateral line and sawcheek is farther east and has red pigmentation between the two spots. Hope these are clearer fellas. I'll go with "Funky Swamp" ... that central pair of dots is "normally" a sawcheek character, but everyting else looks consistent with swamp. The high arched lateral line looks too high for Gulf or any other Etheostoma outside of the Hololepis clan. The habitat was rocky runs of this small creek. They were all in the current, we caught a few of the "funky swamps" along with some Blackbanded Darters. I don't think I've ever caught a Swamp Darter in current under rocks though. Interesting! Mine was from Saluda/Santee drainage though, not Savannah. Could you have been in range for Carolina Darter? Those, swamps, and sawcheeks all look really really similar. For what it's worth, those look just like Sawcheeks I've seen in Virginia though. Double dots on the peduncle, a slightly more robust body shape than a swamp, and a subtle "two tone" brown coloration with the upper half of the body being slightly lighter colored than the lower half. That's what made me think sawcheek at first too, but this site (SW of Atlanta) is out-of-range for sawcheek and Carolina darters, unless it's an undocumented introduced pop.